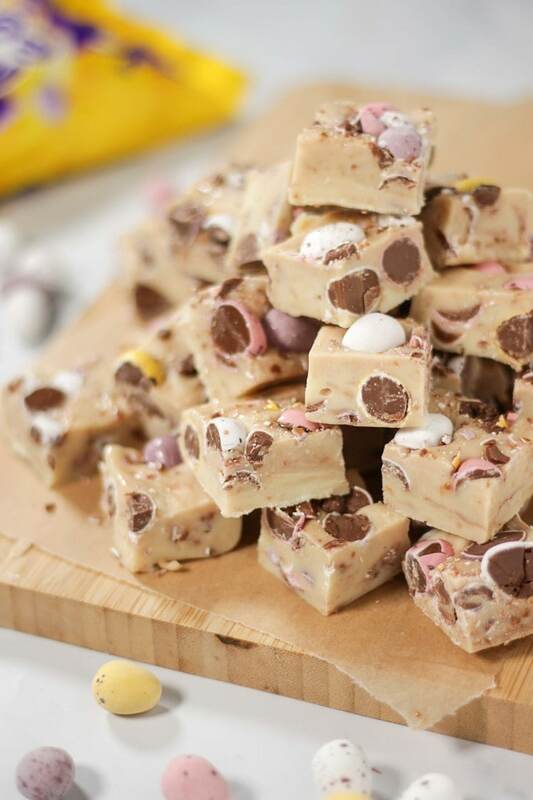 Mini Egg Fudge - The Easiest Easter Treat in 2 Minutes! 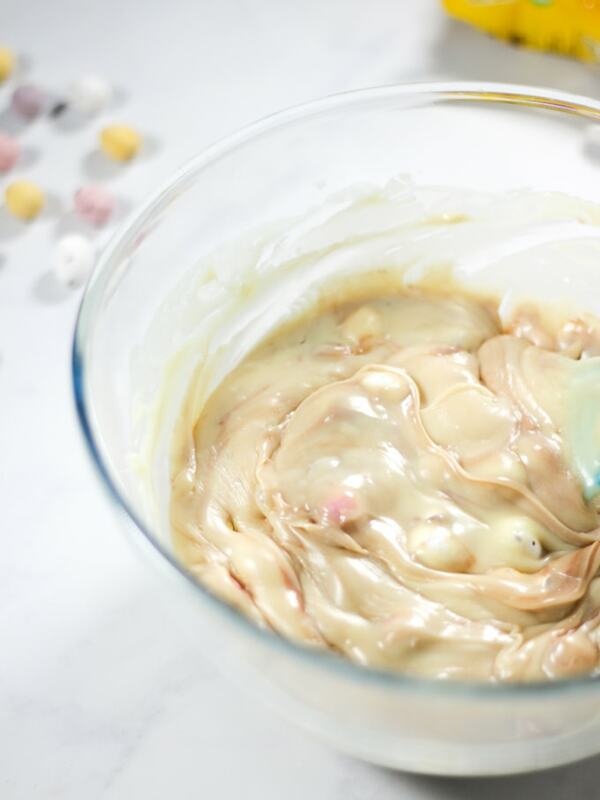 This Microwave Mini Egg Fudge is so simple to make; three ingredients: condensed milk, white chocolate and mini eggs made in just two minutes. It is absolutely fool proof and makes the perfect Easter gift or treat. We all know I love an Easter recipe, there is no denying that. If something can be made with either Mini Eggs or Creme Eggs I’ll have given it a whirl. Because Easter, a holiday celebrated with chocolate? What’s not to love?! 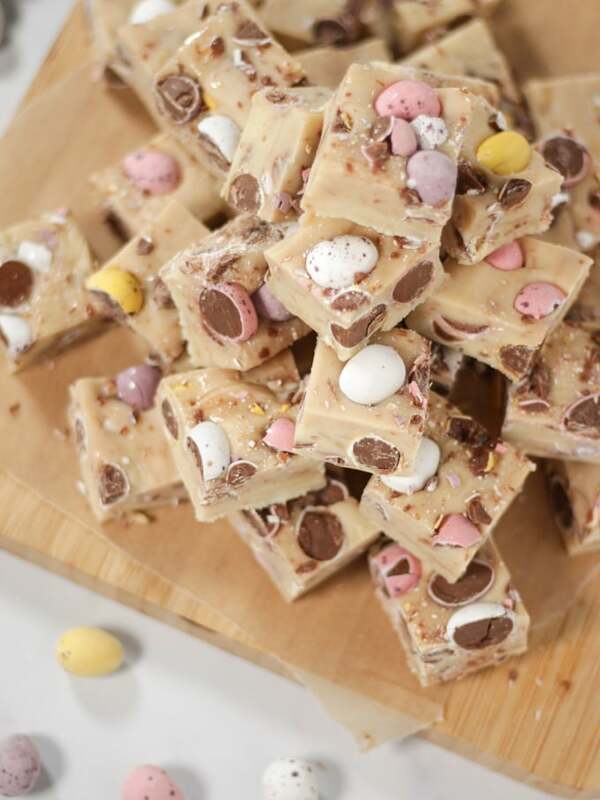 My latest creation is this quick Mini Egg Fudge recipe. It’s a variation on my super simple 2 minute microwave fudge, and it is the perfect Easter gift. I first discovered this fudge recipe almost two years ago and I’ve got quite a fudge repertoire now if you fancy a look; Creme Egg Fudge, Baileys Fudge, Peanut Butter Fudge, and Cookies and Cream Fudge. This Microwavable Fudge is so easy the world is your oyster with all the different flavours on offer. I love to make things like this at the end of the School term to give to teachers, or the children classmates or friends instead of an Easter egg. I find a homemade treat goes down so well, and this recipe is so easy, it’ll have maximum impact for minimum fuss – winner! 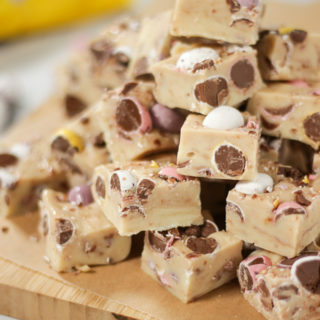 HOW DO YOU MAKE MINI EGG FUDGE? This is not traditional fudge, where you boil and caramelise cream, this is my super easy version. Less faffing, fewer ingredients and super quick. The basic recipe for this Cadbury’s Mini Egg Fudge is so simple, just chocolate and condensed milk. You can cook this in a microwave or a slow cooker. Of course it’s SO much quicker in a microwave though. Just cook it for 30 seconds, two or 3 times, beat really well, mix in some Mini Eggs and pour into a lined dish. 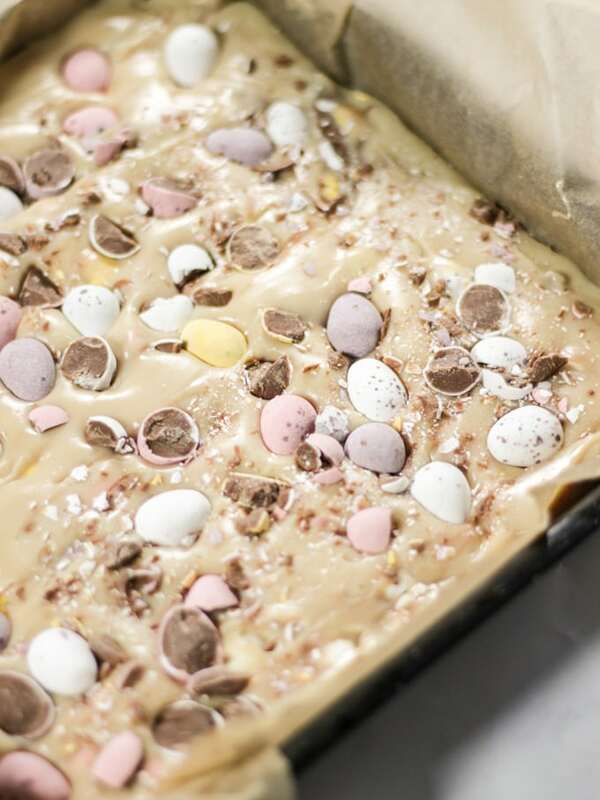 Chop up the remaining Mini Eggs and press them into the fudge mixture, ensuring you spread them evenly so each finished piece has at least one on! Refrigerate overnight and there you have it, delicious creamy microwave fudge. 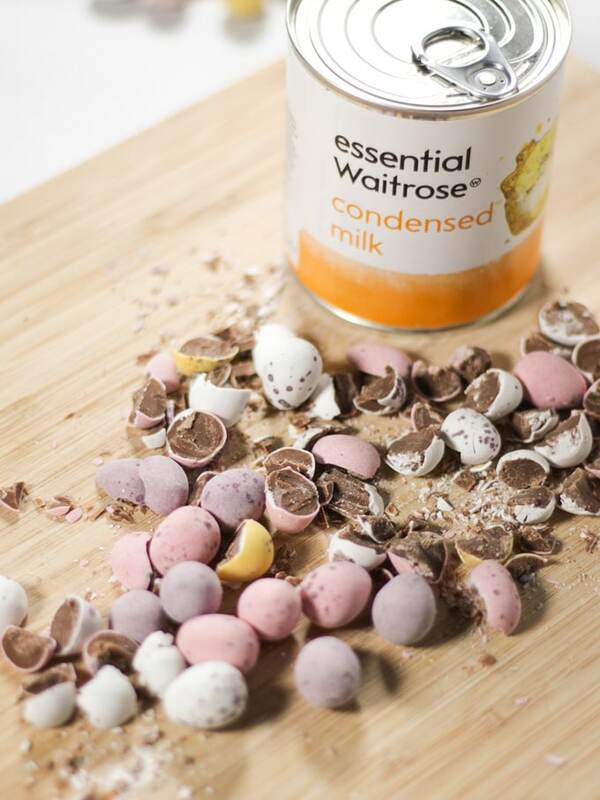 TOP TIP: Crush the Cadbury’s Mini Eggs using the bottom of the tin of condensed milk to WHACK them! HOW DO YOU MAKE MINI EGG FUDGE WITH CONDENSED MILK? 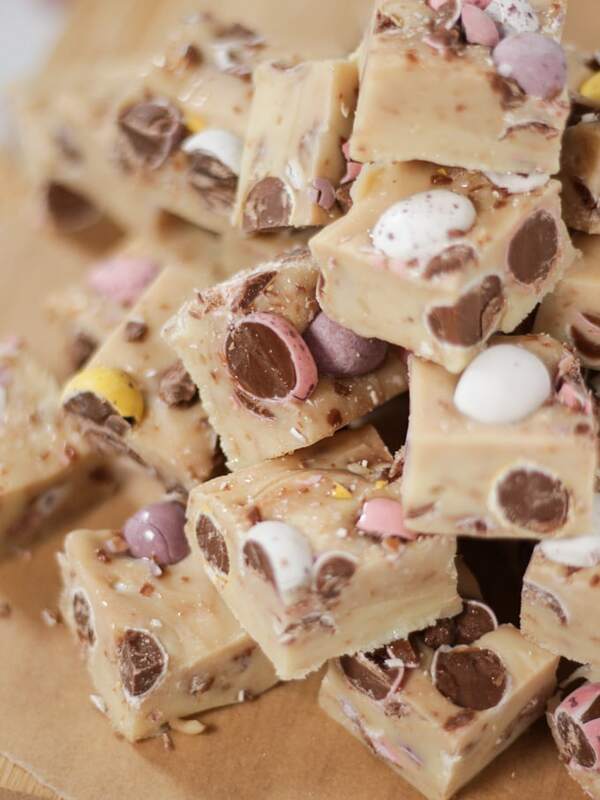 The basic ingredients for this Mini Egg Fudge differ from traditional fudge as you’re not caramelising sugar to set the fudge. The chocolate sets the fudge and the condensed milk adds the sweetness and texture. Be sure to store it in the fridge. CAN YOU USE EVAPORATED MILK INSTEAD OF CONDENSED MILK IN FUDGE? Unfortunately you simply can’t substitute the condensed milk, for anything else. Whilst you could use evaporated milk in place of milk in many situations, evaporated milk and condensed milk are completely different. Evaporated Milk is condensed milk without added sugar, and has an entirely different thickness and texture. HOW LONG CAN YOU KEEP HOMEMADE MINI EGG FUDGE? There doesn’t seem to be any hard and fast rules on this, but I’ve kept it in the fridge for a week and it’s been absolutely fine. It will go really quite firm, so just let it soften a little before eating. I used my favourite Callebaut chocolate for this Mini Egg Fudge recipe. This chocolate is just amazing, it melts so well and really makes a difference to any recipe. When you buy it in bulk (1kg bags at a time) from Amazon it works out about the same price as supermarket chocolate. A good investment I think as it really does make SUCH a difference. I pack the pieces of Mini Egg Fudge, fresh from the fridge, into little bags like these cellophane bags (from Amazon). It adds a special something to make them feel like a real gift. I used white chocolate in the fudge this time to give a sweet creamy flavour. You can use also use milk or dark chocolate if you prefer or half and half works really well too. You can also make this Mini Egg fudge in your slow cooker or crock pot. Depending on your particular slow cooker, this may take a little more or less time. As soon as it is thick and silky smooth looking, it’s ready. If your Slow cooker fudge looks like it’s a bit lumpy or splitting? You can resolve this by giving it a really really good beating with a wooden spoon. It should soon come together again. This Mini Egg fudge is kept stable by being chilled. Keep it in the fridge until you need it and if you’re giving it away, suggest that the lucky recipients keep it chilled too. It should stay fresh for around 2 weeks. You can also freeze your Mini Egg Fudge, wrap your fudge in baking paper and then foil before freezing, you can keep it like this for 2-3 months. This recipe is great as a basis for other flavours of fudge – you could remove the mini eggs or add extra flavourings if you’d like, like this gorgeous vanilla extract (it’s THE best!). 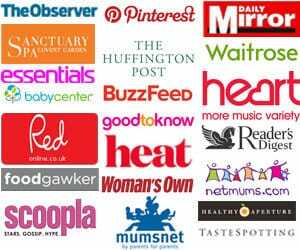 Do you fancy some other Easter gift ideas? How about Creme Egg Brownies or Creme Egg Rocky Road Or what about a show stopping easter dessert? Have a look at my Creme Egg Cheesecake, or Mini Egg Cheesecake recipes, they are gooooood! Hope you enjoy this recipe as much as we do. 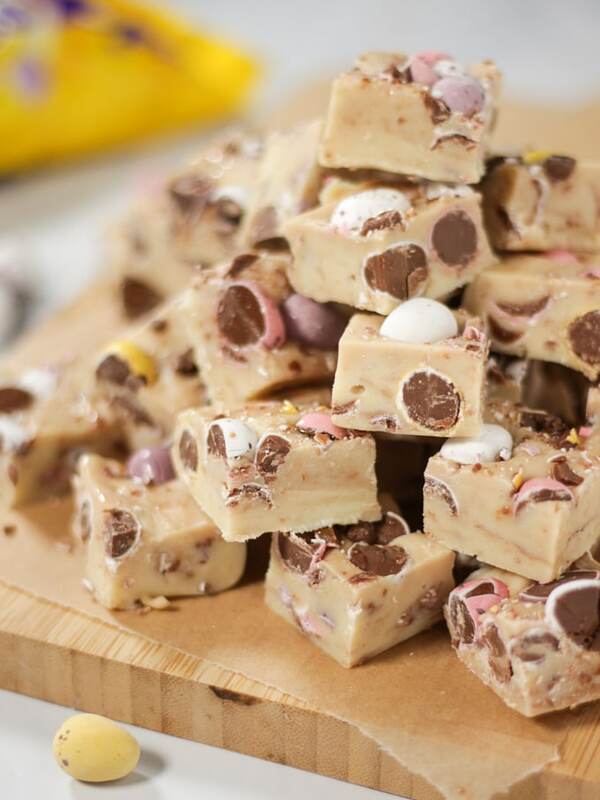 I’d love to know how you got on and what you thought of it if you make this Mini Egg Fudge recipe. Please rate the recipe and leave me a comment below if you do. Oh my gosh Sarah this looks immense!! Looks amazing! I’ve always wanted to try making my own fudge, can’t wait to try this! Oh, this looks amazing! I fear that if I made it, the kids wouldn’t actually get any! Hi, I don’t have a microwave or slow cooker how can I do this recipe. I tried making this and unfortunately mine didn’t set properly. Even after leaving it overnight it was still gooey and stuck to the baking paper, not firm like yours looks in the pictures. I microwaved the mixture 3 times as the chocolate wasn’t fully melted, was this too much? Or do you have any other tips? The taste was amazing though! Ive just made this with a mix of leftover smarties mixed in and mini eggs on the top and it looks delicious. Hoping to save some for easter. Can it be frozen?